Brian Jamieson has dropped his pseudonym, but he's still coming up with the goods. Stephen Butchard reviews his latest project. Brian Jamieson used to be called Damaged Goodz. Damaged. Goodz. With a Z. The dropping of such an amazing moniker is a bummer, without a doubt, but a quick google search proves the name to be a popular one – ‘z’ and all – so maybe the rebranding was a good move. Whether it’s as Damaged Goodz or his regular old Christian name, Jamieson is an artist that deserves attention. He’s been an unsung hero of Scotland’s underground hip-hip scene for years now, his dense bars, clever punchlines and barked delivery typifying the giddy spirit of a battle-centric movement. What the change in moniker does highlight, though, is a move to more mature, personal avenues, something wholly explored on his latest release, ‘Cover’. Along with producer and multi-instrumentalist Nick Turner, Jamieson has crafted a gritty character portrait of scheme-living, broken relationships and mended mental states. It’s an ambitious album, one with a bigger picture more than the sum of its parts. It brings to mind British hip-hop landmarks like the Street’s ‘A Grand Don’t Come For Free’ and Kate Tempest’s ‘Everybody Down’ in its tight narrative focus and artistic presentation of working class life, though ‘Cover’ remains an Scottish album throughout. Jamieson’s humour, wordplay and grim tone feel at one with his peers, but the project’s incorporation of grime, jazz, metal, folk, and even IDM give it a breathless scope of its own. The album tells the story of Sean, a man from a scheme trapped in a downward spiral that's the product of his addictions, vices and surroundings. 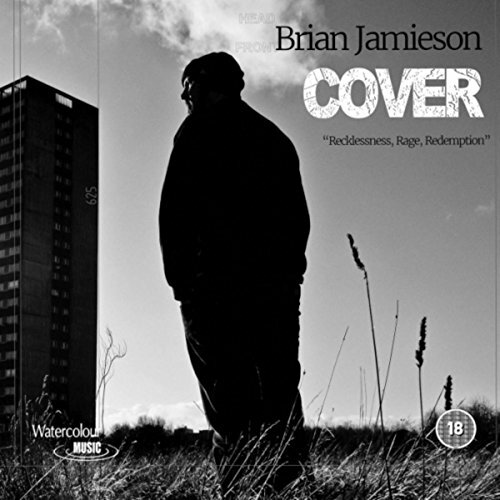 Even in the album’s low-key moment’s, such as on ‘Water Under the Bridge’, Jamieson’s slick penmanship render his story with urgency: “Last orders at last chance saloon/I bark at the moon /the bar’s closing soon / I’m trapped in this gloom / my heart is in ruins / I’m in a dark room / my scars open wounds / friends and family fear I’ve lost the plot / trying to piece together last year dot-to-dot / swallow my wage wi’ these pills a doctor got / I’m an animal – leopards can’t change spot to spot”. A gathering of musical guests play roles that lift ‘Cover’s cinematic vision, but it’s Jamieson’s bars that give tangibility to the tale. The album’s clear ambition make it easy to root for, and the sharp choruses on ‘Clock in/Clock out’ and ‘the Fantastic Adventures of Iceberg Grim’ will have listeners coming back (in a making-of video, Jamieson speaks of wanting nothing more than to condense a message into three minutes, to reach new voices and touch someone who needs it). That said, the album’s messy delivery makes it frustrating to grapple with as a longform piece. The mixing is spotty throughout and it can be hard to make out Jamieson’s voice beneath audio sludge. Some of the accompanying melodies feel worn and ham-fisted, while the expository dialogue within them would give any film buff a migraine (the worst offender might be ‘playpen of mayhem (Welcome to Hainehill) – “I hold keys to the playpen, You’ll never see your baby again.”). Some of the experiments don’t completely land either, such as the acoustic waltz of ‘Behind Every Man There’s a Good Woman’, where Jamieson’s rocky flow threatens to collapse across its five minutes. Unfortunately, 'Cover' never fully captures the power of its concept sonically, but highlights like 'Rage Against the Fruit Machine' - where Jamieson argues with a bartender for crying out loud - demonstrate it's still a worthy listen for any Scottish rap fan.